With Siemplify's ThreatNexus platform, analysts can address a broad range of security operations. 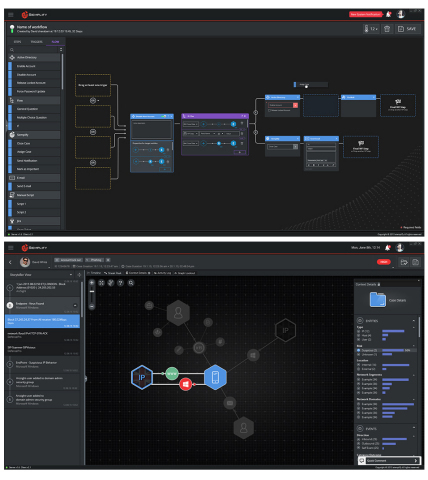 As shown in the images, analysts can have the benefit of both deeply contextualized investigation, as well as automated and semi-automated response by leveraging the ThreatNexus orchestration module when needed. (Graphic: Business Wire). NEW YORK--(BUSINESS WIRE)--Siemplify™ today announced the availability of a new orchestration module for its Siemplify ThreatNexus™ security operations platform, fulfilling the demand for a complete end-to-end SOC solution. ThreatNexus is the industry’s first security operations platform to fully unify the diverse security tools used in organizations, providing SOCs with a comprehensive platform for security operations and incident response, from case management and analytics, to hunting, intelligence, automation and reporting. For the first time, security teams do not need to rely on a patchwork of narrow point solutions to power their SOC. Instead, they can leverage ThreatNexus to deliver the full capabilities needed for the next-generation SOC and reduce incident response times from days to minutes. The full scope of the ThreatNexus platform enables response to all types of attacks both autonomously and where human intervention will continue to be required. The result accelerates and improves every phase of the security operation process.